validation here without really having facts. However, I’ve been wrong before. But I’m not willing to give up my Pro Vs anytime soon. 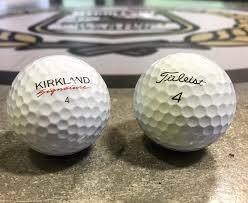 Here’s the deal: I’ve heard everyone I know talk about the new "Kirkland Signature" by Costco golf balls, but I’ve yet to see one or hit one. And I've yet to meet anyone that has, either. It's an interesting phenomenon. I believe that you usually get what you pay for. At $15 a dozen for the new “KSig’s” it’s hard to believe they will compete with the hallowed Pro V1, which are going for around $60 a dozen in most pro shops. In discussing this new craze with a reputable source, I learned that several dozen of the new four-piece pearls have had extreme inconsistencies with firmness or softness of layers, when tested. The consistency factor is where Titleist excels and the reason why they have been regarded No. 1 for my entire existence on this planet. The amount of time, focus and effort that goes into the creation of the Pro V1 ensures that the first ball you hit will be exactly like the next one you hit. I don’t think enough of the Kirkland Signatures have been really put to the test yet to justify putting your spare dozens of Pro Vs on eBay. If you're with me and don’t plan on making the switch yet without a little more evidence, you’ll be happy to hear that Titleist Tuesdays are back at Poppy Hills and Poppy Ridge! 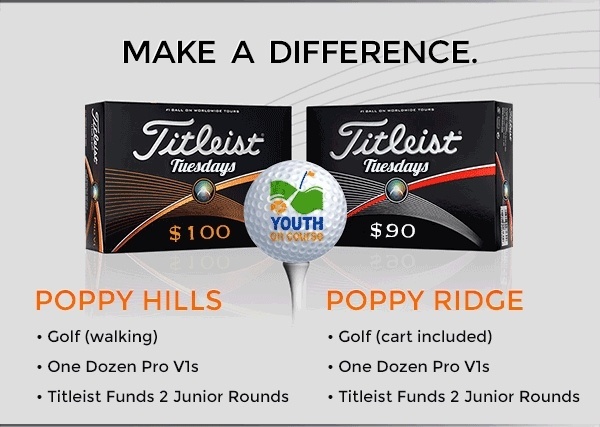 For $100 for the months of January and February on Tuesdays your $100 will provide you with 18 holes of golf, one dozen Titleist Pro V1s and fund two rounds of junior golf through our Youth on Course Foundation. The same program is available at Poppy Ridge for $90. To sign up for Titleist Tuesdays at Poppy Hills in Pebble Beach, call (831) 250-1819 or click the orange button below to see our contact info page. To sign up for Titlelist Tuesdays at Poppy Ridge in Livermore, call (925) 447-6779.